You will earn 7,787 Reward Points. Earn 1 reward point for every 1 dollar spent. Steam and Fan Shut Off Control when compartment door is opened. Heavy-duty 4" (102mm) Skid Resistant Adjustable Legs with Flanged Feet. Cooking capacity for up to six 12" x 20" x 2.5" deep steam table pans (1/1 G/N, 65 mm). Meets agency codes: specifically UL and CUL listed, classified to NSF#4 and Energy Star. High-speed electric convection steamer with open style 1.0 gallon water reservoir located at the bottom of the cooking compartment for easy access and maintenance. 12 kW electric heating element encased in a solid aluminum block for fast and ultra efficient heat transfer. Element never needs deliming because it is not immersed in water. Exclusive, durable 14 gauge stainless steel compartment door and latch withstands abuse and heavy wear. Two piece compartment door with free floating inner door is self adjustable and prevents leaks. Reversible door gasket doubles the life of the gasket. Exclusive SteamChef TM Automatic Drain Control. Generator Drains when main power is turned OFF via 1/2" ball valve with micro switch circuitry. Simple 1 1/4" NPT drain connection required with water saving cold water condenser and 3 minute rinse feature. 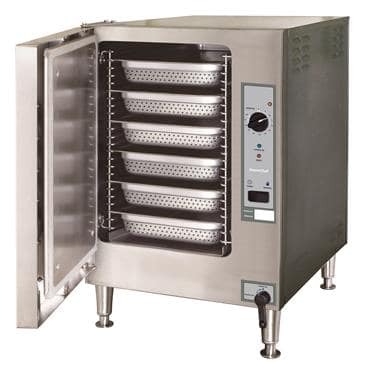 Fan forced convection steam with patented KleanShieldTM cooking compartment design. KleanShieldTM collects and removes condensate waste from the cooking compartment. This keeps the compartment clean, safe from impurities and easy to maintain. Eliminates foaming and avoids contamination of the reservoir water. Automatic water level controls, fills when main power switch is turned ON, Low Water and High Water probes inside cooking compartment maintains water levels during cooking, eliminating the need to manually refill and monitor water level during cooking. Additional Safety Overflow Standpipe. 193˚ preheat and standby temperature. High Temperature Automatic Safety Shut-off. Exclusive SureCook Compartment Controls improves cooking speed and accuracy. New energy saving design reduces water and electric usage. On-demand power control for faster heat up and recovery. Energy saving Standby Feature when not in use. The SureCook timer automatically adjusts the cooking time with the volume of product being cooked, eliminating guesswork on when the product is finished. Includes a 60-Minute Electro-Mechanical Timer, LED Indicator Lights for SureCook Cycle, Power On and Reset. Timed and Manual Bypass Switch for constant steaming. Optional Voltages, 480 Volt (VOS2), see back for alternative voltages. Commercial camp kitchen feeding over 300 persons. A timesaver. Very well made.